What They Say.....When a group of neighborhood women gathers, wine in hand, around a fire pit where their backyards meet one Saturday night, most of them are just ecstatic to have discovered that their baby monitors reach that far. It’s a rare kid-free night, and they’re giddy with it. They drink too much, and the conversation turns personal. 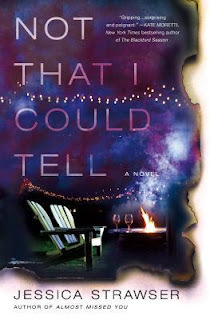 What I Say.....This book had a touch of Big Little Lies in it, and a touch of Karin Slaughter's suspense, adding up to the perfect book club book. Izzy is new to Yellow Springs and trying to start a new life after some heartbreak. The neighborhood seems welcoming, and the women on the block take her in, but after a bonfire one night, Izzy finds herself in the middle of a mystery. Kristin has disappeared, along with her twins. And Izzy and her mom friends are the last people to se her, but no one has much memory of the night. I'm not much of a drinker, but doesn't it seem strange that no one remembers anything? As Kristin's estranged husband begins hanging around their former home, the women have different ideas about his intentions. Izzy fights her attraction to Paul, but should she? Doesn't she deserve to be happy? And doesn't he if his wife ran away with the kids? A great read that leaves you wondering how much any of us really know our neighbors and how much are women willing to do to each other in the quest to not end up alone?